Measuring a fever is usually pretty simple: place a thermometer under a patient's tongue and get an accurate temperature reading within 30 seconds. But that simplicity does not translate when it comes to measuring the temperatures of specific tissues deep inside the body. 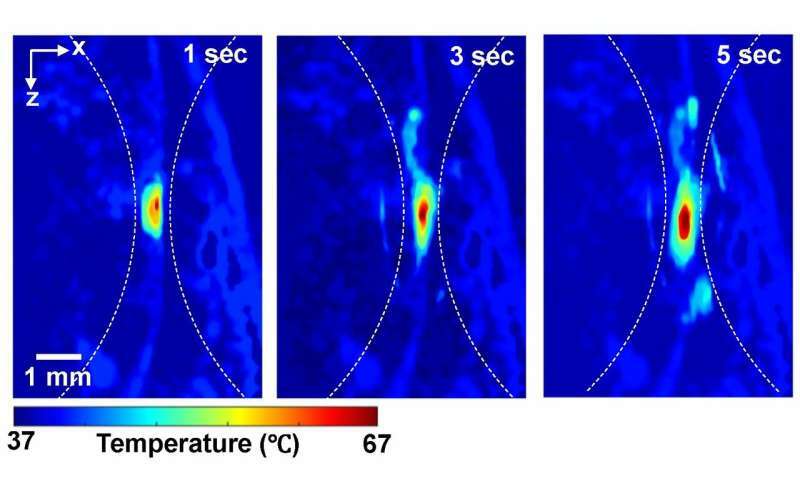 Tracking the temperature of internal tissues is essential for many biomedical studies and thermal therapies of cancers, often affecting a treatment's efficiency or side effects. "If we use MRI or ultrasound, we're looking at relative temperature and operating under the assumption that the patient has a baseline temperature of 98 degrees Fahrenheit, which isn't always the case," said Junjie Yao, assistant professor of biomedical engineering at Duke. "We found a way to measure absolute temperature by using photoacoustic imaging to probe the thermal memory of the tissue." According to Yao, researchers have wanted to use photoacoustic imaging to measure temperature for a long time, but they've consistently experienced technical roadblocks. "The conversion efficiency between light and sound is temperature-dependent, so we know it's possible to measure temperature by listening to soundwaves generated by light," Yao said. "However, we haven't previously been able to measure absolute temperature because the process itself needs to know how many photons are reaching the tissue, which is technically challenging." To get around this missing information, Yao is working with Pei Zhong, a professor in the department of mechanical engineering and materials science who has generated deep tissue heating using high intensity focused ultrasound (HIFU). Their team devised a new approach named thermal-energy-memory-based photoacoustic thermometry, or TEMPT, which uses photoacoustic imaging to measure the tissue's "thermal memory." With TEMPT, researchers take a baseline temperature reading before bombarding the tissue with a burst of nanosecond-long laser pulses. The pulses temporarily increase the tissue's temperature, which is then measured using another photoacoustic pulse. The ability to more precisely measure the temperature of tissues deep in the body has important implications for treating cancer with thermal ablation, which involves heating up tumor cells using HIFU or radio waves until they die. Although thermotherapy is a newcomer in the battle of fighting cancers, researchers are very enthusiastic about this treatment because it doesn't cause the serious side-effects associated with radiotherapy and chemotherapy. "One of the challenges with thermotherapy is that we need to keep the temperature in the most efficient range," Yao said. "If the temperature is too high, we can damage the surrounding tissues, and if it's too low, we're not causing enough damage to the tumor. The TEMPT technology could be incorporated into the treatments to hone in on the perfect temperature." "We're already forming new collaborations, both with physicians and engineers, to continue to advance this new technology in the lab and beyond," Yao said. "This is very exciting because it can potentially be translated to clinical impacts and benefit cancer patients."